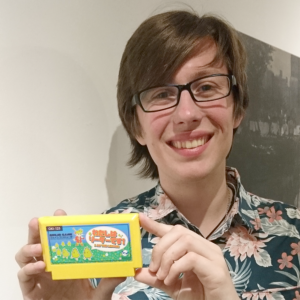 Holding my Famicase entry in Tokyo! I’m a colorblind artist, game designer, and cancer survivor who loves working with others to create memorable experiences. In 2017, I founded my own indie game company, JellyTeam, with two friends. Our first release is Super Slime Arena! A lot of my work is influenced by games and visual media from the 90s but while I love pixel art and retro styles, I pride myself on being versatile and adapting to whatever approach works best for each project. I have a Bachelor of Fine Arts in Digital Art and Game Design from Northeastern University in Boston. For more about my experience, please see my resume. 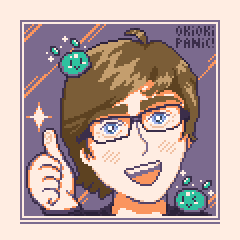 I also currently write for Honey’s Anime, covering anime, games, music, and other facets of otaku pop culture, and have previously worked in educational/serious games, high-end training simulations, user interface, and graphic design.